This entry was posted on January 8, 2014 by seekraz. It was filed under Photos - Outdoors and was tagged with farmland and mountains, Goshen Utah, photography, snow covered mountains, Utah, Utah County, Utah photography, Wasatch Mountains. Thank you very much, Scott…wishing the same for you and yours. Very nice…. it’s hard to believe that I once lived up near the top of one of them peaks. Seems like another life altogether. That would have been one hell of a place to live…and yes, it’s funny how those lives seem to pass like that…all those ones we leave behind while taking on the next one…. Looks pretty bleak, but then, most everything does at that time of year, before most of the shoots push through. Lovely background, though! Yes, a little bleak during that time of awakening and transition…. I rather like that background, too! l Scott I never realized Utah was so beautiful until was working for the railroad crews up in Wyoming and driving thru Wyoming, Utah, and Idaho it is a lot more than I thought then you start posting your beautiful mountains and then I need. Thank you for sharing your talents with the rest of us. I’m glad you enjoy the photos, Kat…it’s a pleasure sharing them. We have a Goshen New Hampshire but unfortunately you’ll never see views like that there. That’s really pretty with the turning seasons! 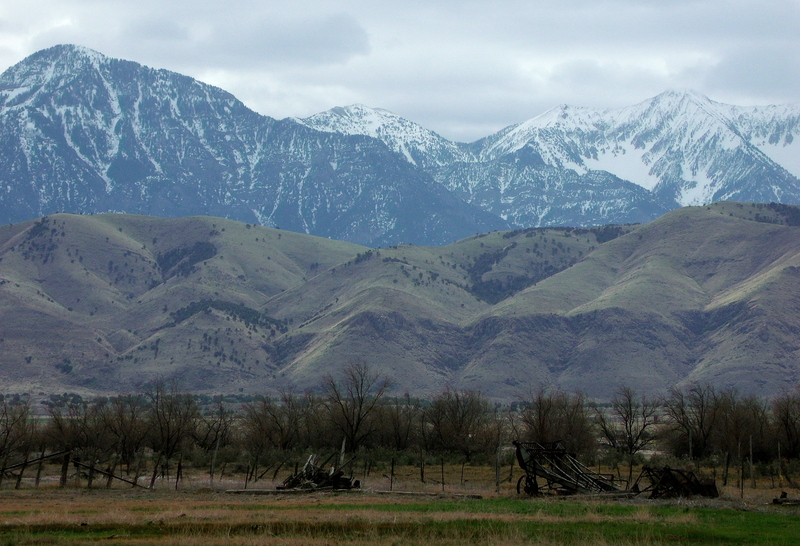 I like that time of change, too, with the snow still on the mountains providing such a beautiful background…. Absolutely stunning! What I wouldn’t give to see those in person and climb the mountains in the snow. It’s a real treat, James. I’m very fortunate to have them so close…. My kind of wonderful, Adrian! I cannot imagine living and working in the shadow of these mountains! I think I’d be paranoid. It’s as if some huge primordial creature emerged here. (And I reckon it did, actually.) The mountains are imposing. And your photograph captures that perfectly. The scale of those mountains is impressive……….and while I’m here, may I comment on your stunning photo of the candelabra twig, as I wasn’t quick enough to get one in there…….less is definitely more. Well done Scott. Those mountains and their brothers are everywhere here, John…at least in this part of my world. And thank you for your kind words about the candelabra twig…I found a near stark beauty in that scene…and yes, with less being more.